Plant and algae cells produce the energy that is essential for the maintenance of life using chloroplasts (plastids) and mitochondria. Chloroplasts synthesize carbohydrates from atmospheric carbon dioxide and water by photosynthesis using the energy of sunlight, release oxygen and deliver the products to the host cell as food. Mitochondria consume oxygen and organic fuel to produce most of the ATP by cellular respiration. It is thought that chloroplasts and mitochondria originated as symbiotic bacteria that were engulfed by ancestral eukaryotic cells 1.5–2 billion years ago. Although these organelles have their own genomes that divide and segregate, very little is known about the underlying mechanisms. 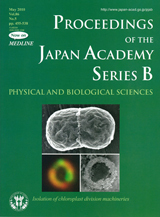 The cover illustration of this issue shows a scanning electron microscopic image of dividing chloroplast with the chloroplast division machinery (upper) and fluorescence (lower left) and transmission electron microscopic (lower right) images of isolated chloroplast division machineries. 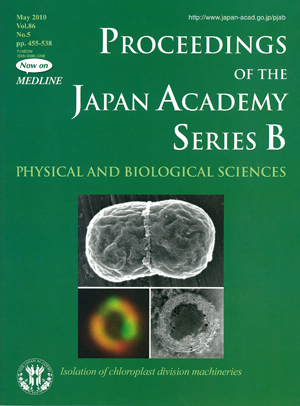 In the article on page 455–471 of this issues, Dr. Kuroiwa and his colleagues discovered the mitochondrial and chloroplast division machineries, and resolved key issues concerning the fundamental mechanisms of their division, and of mitochondrial and chloroplast maternal inheritance, which had long been elusive. To advance the field from the descriptive to the molecular level, he used the red alga Cyanidioschyzon merolae as a model organism to study organelle division. He and his colleagues determined the full nucleotide sequence of this algal genome; this was the first eukaryotic genome to be fully sequenced. To elucidate the complete set of proteins and other components required for organelle division, Dr. Kuroiwa isolated the organelle division machineries from highly synchronized cells. Using the complete C. merolae genome sequence and the matrix assisted laser desorption/ionization time of flight mass spectrometry (MALDI TOF-MS) analysis, he identified 30–40 essential proteins, including FtsZ and dynamin.